Home > Articles > How to eat grapefruit? A fruit with a bitter taste not appreciated by everyone. Let’s talk about grapefruit in its yellow and pink variant (a little sweeter). Great to prepare a nice juice alone or together with other citrus fruit, to eat whole or to be used in making sweet and sour recipes in the kitchen. With this fruit, however, we need to pay attention. It has been demonstrated its ability to interfere with some types of drugs (including the contraceptive pill and anti-cholesterol drugs) and it can take very little, for example, a juice plus a whole fruit, to go to decrease the absorption of medicines with dangerous risks to health. To avoid therefore if you are taking medicines unless it was your doctor to give you the ok for the consumption of this fruit. In other cases, instead (excluding gastritis) grapefruit is absolutely recommended given the wealth of properties and the few calories it provides. Like other citrus fruits, it contains good quantities of vitamin C (1 grapefruit = 70/80 mg) as well as vitamins A and B group. It is rich in fiber, mineral salts (in particular potassium) and flavonoids, or antioxidants! It is also often recommended in slimming diets because of its fat-burning qualities and because it is rich in water as it stimulates diuresis. 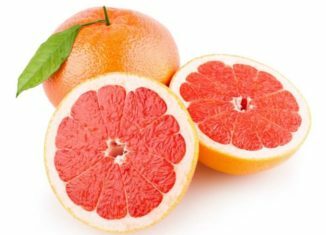 Grapefruit is also a fruit particularly useful for detoxification of the liver, for the reduction of LDL cholesterol and, in its pink variant, thanks to the presence of lycopene for the prevention of certain tumors. Grapefruit also lends itself to the preparation of some foods. Obviously, during cooking, most of the properties of this fruit are less, but it can still be interesting and fun to prepare a menu that sees our grapefruit “friend” as the absolute protagonist. Grapefruit Risotto could be a perfect main dish to eat something unique and healthy. It is prepared by finely slicing a couple of white onions and browning them in oil. Then add the rice and cook it, adding a little at a time, alternately, a ladle of vegetable stock and one of grapefruit juice, both hot. When cooked, after looking for twenty minutes, add two tablespoons of chopped parsley and leave the rice to rest on fire, adjusting with oil, salt, and pepper. As a strong dish, we suggest the Lamb with Curry and Grapefruit, which is obtained by browning the lamb in a mixture of oil and chopped onions, then sprinkle all of the curry powder, bringing it almost cooked. Sprinkle with the juice of a grapefruit (yellow or pink) and cook for another minute on a low flame, then add a sprinkle of chopped coriander and garnish with very thin slices of grapefruit, taking care not to heat the inner white part too much. peel that could be bitter. Finally, a delicious sweet of grapefruit, easy to prepare by dipping the slices of the fruit in the cocoa liquor, then sprinkle with brown sugar and cinnamon powder. These are the most creative ways to add some grapefruit into your daily cooking routine for yummy dishes but, if you want to keep things simple and you want to really enjoy the benefits of the portentous fruit you should totally go for a homemade juice. This is a powerful healthy remedy to boost your natural defenses and your entire health. Certainly, grapefruit is precious as a disinfectant and stimulant of the digestive system, so it is recommended to use it at the end of a hearty meal, even and especially in the evening, thus dispelling the theory that citrus fruits are the enemies of the night. In this, yellow citrus is also favored by the low sugar content, which makes it preferable to other “colleagues” such as oranges or mandarins.